With other parts of the country buried in snow, today the Santa Cruz Lumber Co. took advantage of the unseasonably warm sixty-nine degree day to commence limited logging operations. A large old-growth redwood located at the new logging camp, established toward the end of last fall, was felled and transported to the sawmill as a "dry run" for spring. "The weather is so (explicative deleted), nice, that we figured to shake out the gremlins from the new logging site! 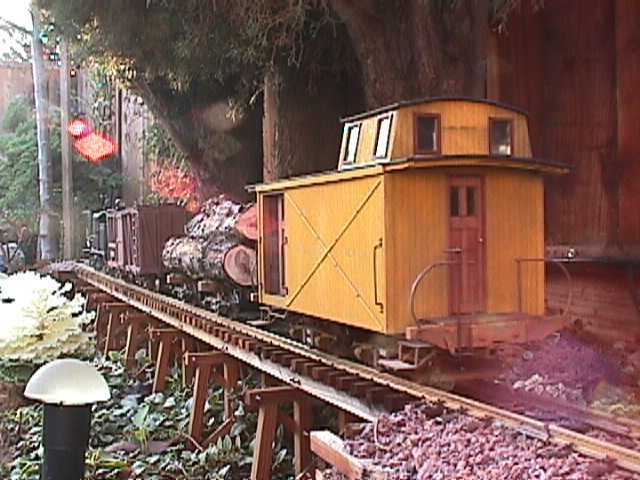 ", explained Dwight Ennis, Owner and Chief Executive of the Santa Cruz Lumber Company. He went on, "It's a (explicative deleted), good chance to get the (explicative deleted), skidders and yarders going, and find (explicative deleted), trouble spots before full logging starts in the (explicative deleted), Spring." SCLCo No. 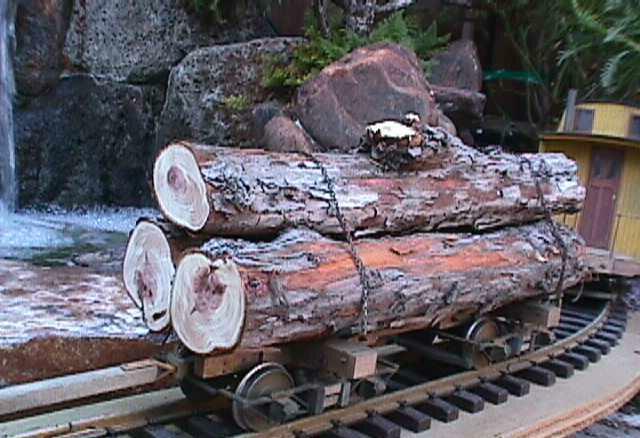 1 hauled part of the felled tree, cut into three twenty-foot logs, to the sawmill as part of today's "dry run." No. 1 and it's train crosses the trestle on its way to the sawmill. The old tree is just ahead of the caboose. 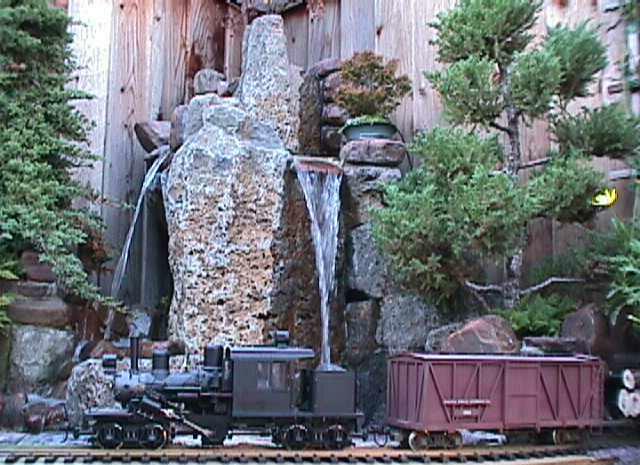 The train passes one of the "strange trees" inhabiting the area on its way to the sawmill. No. 1 crosses in front of spectacular "Mick-elangelo's Falls" on a temporary deck bridge, soon to be replaced with a full Howe Through Truss Bridge. Plans call for fabricating the new bridge from the native redwood. 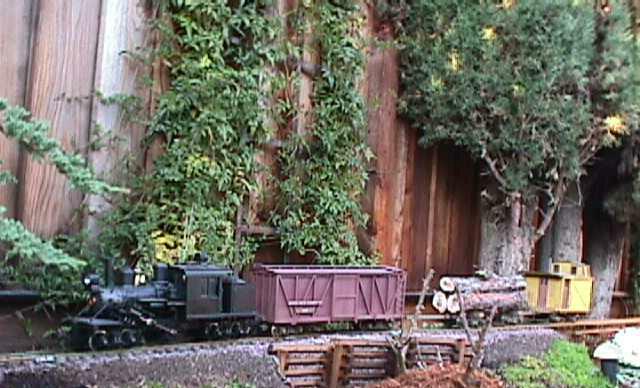 A closeup of the old redwood, now heading for the sawmill. 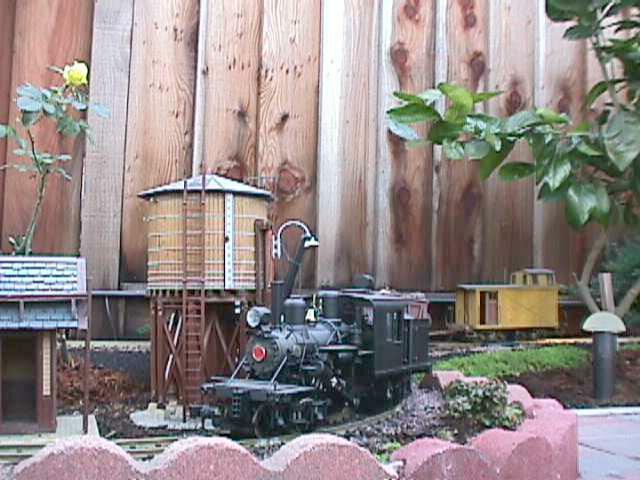 With only a few miles to go, No 1 and her train pass in front of the SCLCo water tank. The "strange rock" in the foreground was created upon the insistance of Ms. Catherine Ennis, CFO of the SCLCo, and well-known tree-hugger! Her concern was for "the safety of hikers traversing the area" and, since she controls the purse strings, the railroad was forced to take extraordinary measures to secure her satisfaction (not for the first or the last time either)!! Unlike the "strange trees" however, this was an entirely artificial construct.